This is the training report on Residential Building Construction which is taken at “Shree India Real Land Developers Pvt Ltd. and a multistory residential building is studied in this project. 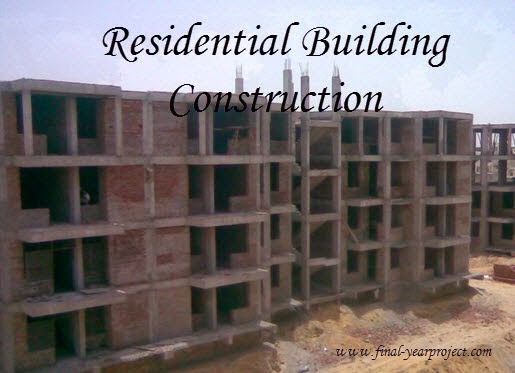 This report include project findings, types of buildings, types of material used in construction, function of different material, equipments, machines used, different terms used in construction etc. This project is a multi-storey residential building. This building is constructing for middle class people. You can also Subscribe to FINAL YEAR PROJECT'S by Email for more such projects and seminar. In such building sleeping accommodation is provided. IT includes the living room, bed room, kitchen, hall, toilet and bath room. It may be a single storey building or apartments. These includes any building using for school, college, assembly for instruction, education or recreation. These building are used for different purposes , such as medical or other treatment or care of a person suffering from a physical or mental illness etc. These building includes hospital, sanitoria, jail etc. These are buildings in which products or material s of all kind of properties are fabricated, assembled, processed. For example refineries, gas plant, mills etc. There are various chapter in this report and in chapter 9 municipal water distribution system is evaluated. This topic has two primary objectives: The first is to understand the evaluation of an installed municipal water supply delivery system by identifying all the physical components of any specific water distribution system. The same basic concepts and principles apply to small community water systems and large city water systems.